Samuel Henry Gordon Alken (1810-1894), Artist. Artist associated with 1 portrait. George Augustus Sala (1828-1895), Journalist. Artist associated with 1 portrait, Sitter in 17 portraits. 10th (Prince of Wales's Own) Regiment of Light Dragoons (Hussars), Cavalry regiment of the British Army. Sitter in 1 portrait. 11th (Prince Albert's Own) Hussars, Cavalry regiment of the British Army. Sitter in 1 portrait. 12th (Prince of Wales's Own) Royal Lancers, Cavalry regiment of the British Army. Sitter in 1 portrait. 13th Light Dragoons, Cavalry regiment of the British Army. Sitter in 1 portrait. 14th (The King's) Regiment of Light Dragoons, Cavalry regiment of the British Army. Sitter in 1 portrait. 15th (The King's) Regiment of Light Dragoons (Hussars), Cavalry regiment of the British Army. Sitter in 1 portrait. 16th (The Queen's) Regiment of Light Dragoons (Lancers), Cavalry regiment of the British Army. Sitter in 1 portrait. 17th Regiment of Light Dragoons (Lancers), Cavalry regiment of the British Army. Sitter in 1 portrait. 1st (Royal) Regiment of Dragoons, Cavalry regiment of the British Army. Sitter in 1 portrait. 1st Duke of Wellington's Groom. Sitter in 1 portrait. 1st Duke of Wellington's Horse. Sitter in 1 portrait. 1st King's Dragoon Guards, Heavy cavalry regiment of the British Army. Sitter in 1 portrait. 1st Regiment of Life Guards, Senior regiment of the British Army and part of the Household Cavalry. Sitter in 1 portrait. 2nd Dragoons (Royal Scots Greys), Cavalry regiment of the British Army. Sitter in 1 portrait. 2nd Queen's Dragoon Guards, Heavy cavalry regiment of the British Army. Sitter in 1 portrait. 2nd Regiment of Life Guards, Senior regiment of the British Army and part of the Household Cavalry. Sitter in 1 portrait. 33rd (Duke of Wellington's) Regiment of Foot, Infantry regiment of the British Army. Sitter in 1 portrait. 3rd (Prince of Wales's) Dragoon Guards, Heavy cavalry regiment of the British Army. Sitter in 1 portrait. 3rd (The King's Own) Regiment of Light Dragoons, Cavalry regiment of the British Army. Sitter in 1 portrait. 4th (Royal Irish) Dragoon Guards, Heavy cavalry regiment of the British Army. Sitter in 1 portrait. 4th (The Queen's Own) Regiment of Light Dragoons, Cavalry regiment of the British Army. Sitter in 1 portrait. 5th (Princess Charlotte of Wales's) Dragoon Guards, Heavy cavalry regiment of the British Army. Sitter in 1 portrait. 6th (Inniskilling) Regiment of Dragoons, Cavalry Regiment of the British Army. Sitter in 1 portrait. 6th Dragoon Guards (Carabiniers), Cavalry regiment of the British Army. Sitter in 1 portrait. 6th Dragoon Guards (Carabiniers), Heavy cavalry regiment of the British Army. Sitter in 1 portrait. 7th (The Princess Royal's) Dragoon Guards, Heavy cavalry regiment of the British Army. Sitter in 1 portrait. 7th (The Queen's Own) Regiment of Light Dragoons (Hussars), Cavalry regiment of the British Army. Sitter in 1 portrait. 8th (The King's Royal Irish) Regiment of Light Dragoons (Hussars), Cavalry regiment of the British Army. Sitter in 1 portrait. 9th Queen's Royal Lancers, Cavalry regiment of the British Army. Sitter in 1 portrait. James Hamilton, 1st Duke of Abercorn (1811-1885), Landowner and politician; Lord Lieutenant of Ireland. Sitter in 13 portraits. Richard Airey, 1st Baron Airey (1803-1881), Army officer. Sitter in 4 portraits. Artillery, Combat arm of the British Army. Sitter in 1 portrait. Assistant Adjutant General, Administrative officer in the British Army. Sitter in 1 portrait. Assistant Quartermaster General, Officer in charge of supplies for the British Army. Sitter in 1 portrait. Band and pipers of the 93rd Highlanders, Band of an infantry reigment of the British Army. Sitter in 1 portrait. Band of the 6th (Inniskilling) Regiment of Dragoons, Band of a cavalry regiment of the British Army. Sitter in 1 portrait. Band of the Coldstream Guards and Scots Fusilier Guards, Band of an infantry regiment of the Household Division of the British Army. Sitter in 1 portrait. Band of the Royal Horse Guards, Band of a cavalry regiment of the British Army. Sitter in 1 portrait. Band of the Royal Marines, Band of a light infantry force of the Naval Service of the United Kingdom. Sitter in 1 portrait. Batons of 1st Duke of Wellington, Symbol of military rank. Sitter in 1 portrait. Battalion of the Coldstream Guards, Infantry regiment of the Household Division of the British Army. Sitter in 1 portrait. Battalion of the Grenadier Guards, Infantry regiment of the Household Division of the British Army. Sitter in 1 portrait. Battalion of the Scots Fusilier Guards, Infantry regiment of the Household Division of the British Army. Sitter in 1 portrait. Henry Charles Fitzroy Somerset, 8th Duke of Beaufort (1824-1899), Politician, army officer and landowner. Sitter in 8 portraits. Sir George Brown (1790-1865), General. Sitter in 4 portraits. Captains, Junior officer of the British Army. Sitter in 1 portrait. John Carter (1804-1878), Sheriff of London, Lord Mayor of London and Chronometer maker. Sitter in 1 portrait. Cavalry, Branch of the British Army that fought on horseback. Sitter in 1 portrait. Thomas Challis (1794-1874), Skin broker; Lord Mayor of London. Sitter in 2 portraits. Chaplains of the Tower, Anglican ministers of the Chapel Royal of St Peter ad Vincula at the Tower of London. Sitter in 1 portrait. Chelsea Pensioners, In-pensioners at the Royal Hospital Chelsea for former members of the British Army. Sitter in 1 portrait. City Marshal, Officer with powers to maintain order within the City of London. Sitter in 1 portrait. Commander of the Royal Artillery, Commander of the Royal Artillery. Sitter in 1 portrait. Companions of the Order of the Bath. Sitter in 1 portrait. Conductors. Sitter in 1 portrait. Alexander Angus Croll (1811-1887), Sheriff of London and civil engineer. Sitter in 1 portrait. Crown Equerry, Operational head of the Royal Mews of the Royal Household of the Sovereign of the United Kingdom. Sitter in 1 portrait. Deputations from public bodies. Sitter in 1 portrait. Deputy Quartermaster General, Army staff officer. Sitter in 1 portrait. Drummers of the Grenadier Guards, Drummers of an infantry regiment of the British Army. Sitter in 1 portrait. Edward, Prince of Saxe-Weimar (1823-1902), Field Marshal. Sitter in 10 portraits. Francis Jervoise Ellis-Jervoise (1809-1881), High Sheriff of the county of Southampton and landowner. Sitter in 1 portrait. Enrolled Pensioners, Military pensioners of the British Army. Sitter in 1 portrait. Field Officer in Brigade Waiting, Ceremonial office in the Royal Household of the Sovereign of the United Kingdom. Sitter in 1 portrait. Sir James Freeth (1786-1867), Quatermaster General to the Forces. Sitter in 1 portrait. 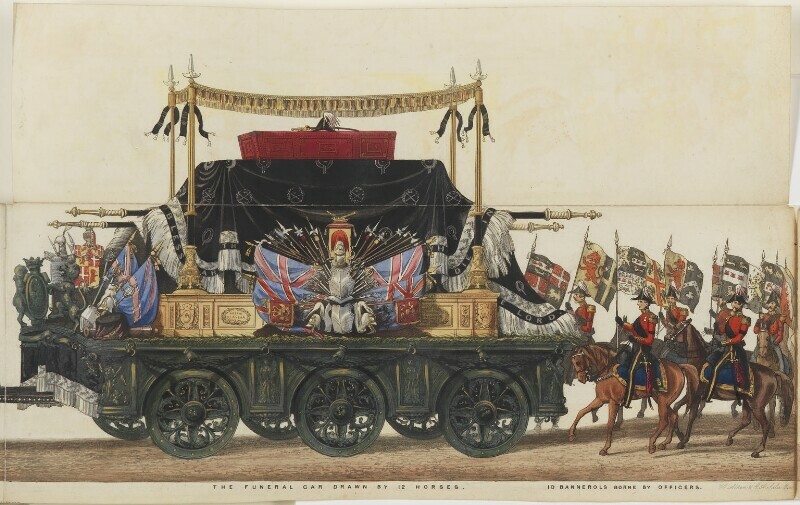 Funeral Car of 1st Duke of Wellington. Sitter in 1 portrait. Fusiliers, Infantry regiment of the British Army. Sitter in 1 portrait. Groom of the Bedchamber, Office in the Royal Household of the Sovereign of the United Kingdom. Sitter in 1 portrait. Her Majesty's Suite, Members of Queen Victoria's Household. Sitter in 1 portrait. Heralds, Officer of Arms. Sitter in 1 portrait. Infantry, Branch of the British Army that fights on foot. Sitter in 1 portrait. Knights Commanders of the Order of the Bath. Sitter in 1 portrait. Knights Grand Cross of the Order of the Bath. Sitter in 1 portrait. Robert Laurie (1806-1882), Norroy King of Arms and Clarenceux King of Arms. Sitter in 1 portrait. Lieutenant Colonel, Commissioned officer in the British Army and Standard Bearer at the funeral of the 1st Duke of Wellington. Sitter in 1 portrait. Lieutenant Colonel, Commissioned officer of the British Army and Guidon Bearer at the Funeral of the 1st Duke of Wellington. Sitter in 1 portrait. Lieutenant Colonel, Commissioned officer of the British Army and bearer of the Banner of Wellesley at the funeral of the 1st Duke of Wellington. Sitter in 1 portrait. Lieutenant Colonel, Commissioned officer of the British Army and bearer of the Great Banner at the Funeral of the 1st Duke of Wellington. Sitter in 1 portrait. London District and Chaplain-General of the Forces, Senior Anglican Chaplain of the British Army. Sitter in 1 portrait. William Drogo Montagu, 7th Duke of Manchester (1823-1890), Army officer and politician, Lord of the Bedchamber to Prince Albert. Sitter in 6 portraits. Marshalmen, Honorary appointment within the Royal Household of the Sovereign of the United Kingdom. Sitter in 1 portrait. Members of the Duke's household. Sitter in 1 portrait. Messenger of the College of Arms. Sitter in 1 portrait. Sir Charles James Napier (1782-1853), Army officer and Conqueror of Sind. Sitter in 11 portraits. Officers, Officers bearing bannerols at the funeral of the 1st Duke of Wellington. Sitter in 1 portrait. Pallbearers, Eight officers who carried the coffin of the 1st Duke of Wellington. Sitter in 1 portrait. Physicians of the Forces, Medical practitioner in the British Army. Sitter in 1 portrait. Lyon Playfair, 1st Baron Playfair (1818-1898), Chemist, scientific adviser and Scottish politician; MP. Sitter in 16 portraits. Private carriage of 1st Duke of Wellington. Sitter in 1 portrait. Private carriage of 2nd Duke of Wellington. Sitter in 1 portrait. Private carriage of Queen Victoria. Sitter in 1 portrait. James Pulman (1783-1859), Norroy King of Arms and Clarenceux King of Arms. Sitter in 1 portrait. Pursuivants of Arms, Junior officer of the College of Arms. Sitter in 1 portrait. Regiment of Life Guards, Senior regiment of the British Army and part of the Household Cavalry. Sitter in 1 portrait. Relations and friends of 2nd Duke of Wellington. Sitter in 1 portrait. Rifle Brigade, Infantry rifle regiment of the British Army. Sitter in 1 portrait. The Royal Artillery Band, Band of the Royal Artillery. Sitter in 1 portrait. The Royal Artillery, Artillery arm of the British Army. Sitter in 1 portrait. Royal Horse Artillery, Part of the Royal Artillery of the British Army. Sitter in 1 portrait. Royal Horse Guards Blue, Part of the cavalry regiment of the British Army. Sitter in 1 portrait. Royal Marines, Light infantry force of the Naval Service of the United Kingdom. Sitter in 1 portrait. Sappers, Combat engineers in the British Army. Sitter in 1 portrait. State Band. Sitter in 1 portrait. State Band 1st Regiment of Life Guards, Band of a senior regiment of the British Army and part of the Household Cavalry. Sitter in 1 portrait. State Band 2nd Regiment of Life Guards, Band of a senior regiment of the British Army and part of the Household Cavalry. Sitter in 1 portrait. Ward Beadles. Sitter in 1 portrait. Arthur Richard Wellesley, 2nd Duke of Wellington (1807-1884), Soldier and politician. Sitter in 2 portraits. Sir George Augustus Wetherall (1788-1868), Army officer. Sitter in 2 portraits. The Duke of Wellington's funeral in November 1852 was one of the most spectacular ever seen in England. The procession to St Paul's Cathedral was watched by a crowd estimated at a million and a half people. This printed panorama, over sixty-six feet long, was published to commemorate the event. An iPad app on the funeral procession is available from www.npg.org.uk/wellington. More information about this work can be found in the Heinz Archive and Library's record for this work. Britain and America sign a treaty establishing an International Copyright agreement. Dickens, whose Bleak House is also published this year, was a particularly outspoken critic of these laws, as his works were freely published in America without any protection over copyright or royalties. He had lobbied the American Congress over the issue during his North American reading tour of 1842. David Livingstone makes a six month journey from the Zambezi river to the west coast of Africa. Harriet Martineau translates The Positive Philosophy of August Comte. A scientific approach to understanding the natural world and human and social relations, positivism has an important influence on the development of the social sciences. Diplomatic row over Napoleon's call to the Turkish empire to restore Roman Catholic rights in the Holy Land. Russia asserts her role of protecting the rights of all Christians in the Ottoman empire; French and British fleets are dispatched to the Dardanelles. The Turkish sultan, declaring that he will look after the rights of Christians, heightens tension, and the Crimean war begins with Turkey declaring war on Russia.